Stir flour, sugar, baking powder, cornstarch, lemon zest, salt and oil. Add the liqueur and two tablespoons of warm water that has been dissolved turmeric. Mix the ingredients and make a smooth and soft, adding more water if necessary. Divide the dough into several pieces and let them roll it with the palm of the hand on the floured work surface, forming rolls. With a knife, cut the roll into pieces about 1 cm; with floured hands and work it to roll into balls and place them on a lightly floured tray. 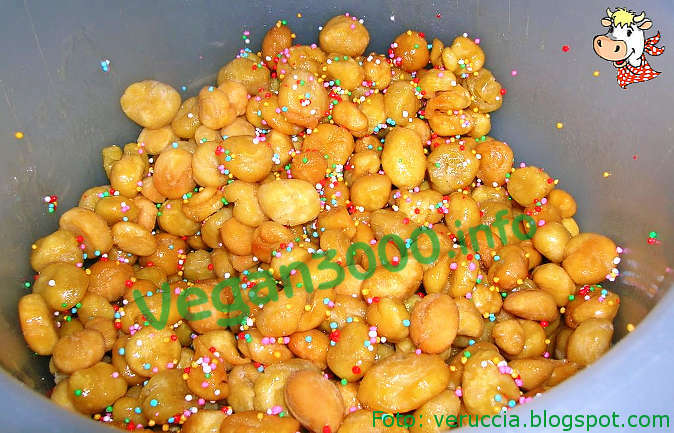 Fry the struffoli in very hot oil until they are golden. drain on paper towels and tamponateli, place them in a container of a suitable size and sprinkle with malt, topped with sprinkles. You can prepare them in advance, indeed, they will gain flavor after a day's rest.